EXTRA-EFFECTIVE: The dermatologist-recommended clinical strength solution for excessive sweating. Our clinically proven antiperspirant and deodorant was specifically designed to stop underarm sweat and help manage the symptoms of hyperhidrosis. Achieve zero sweat, restore confidence, and enjoy life with dry and fresh underarms! EASY TO USE: With a pea sized amount of Carpe Antiperspirant Lotion you can instantly reduce sweat without side effects. Apply daily for best results and say goodbye to your sweaty, smelly underarms without having to suffer from the side effects associated with other solutions. AWARD WINNING FORMULA: As seen on Good Morning America, Carpe's patent-pending, FDA-compliant formula has been independently tested and a proven over-the-counter sweat treatment. 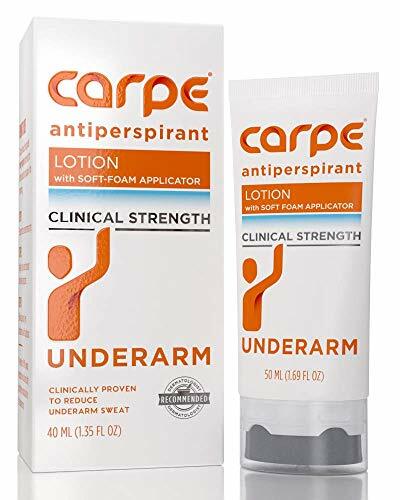 100% Money Back Guarantee: Carpe was formulated to restore confidence and deliver a peace of mind, so sweaty armpits are the last thing that you need to think about. Carpe has changed the lives of thousands and thousands of people, but if you aren't one of them, no worries - we will give you your money back, no questions asked!